The Q3Painter class is a Qt 3 compatibility wrapper for QPainter. Prior to Qt 4, QPainter specialized the pen drawing for rectangle based functions (in particular: drawRect, drawEllipse, drawRoundRect, drawArc, drawChord and drawPie). When stroking a rectangle of width 10, the pen would draw a rectangle of width 10. Drawing a polygon defined by the corner points of the same rectangle the stroke would have a width of 11. As we can see, stroking the rectangle so it gets a width of 10, means the pen is drawn on a rectangle on width 9. The polygon, however follows a consistent model. 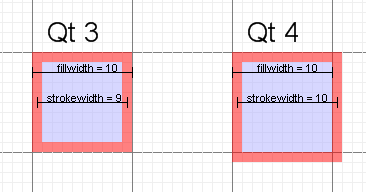 In Qt 4, all rectangle based functions have changed to follow the polygon approach, which means that the rectangle defines the size of the fill, and the pen follows the edges of the shape. For pen widths of 0 and 1 this means that the stroke will be inside the shape on the left and the top and outside on the bottom and right. The reason for the change in Qt 4 is so that we provide consistency for all drawing functions even with complex transformations. Constructs a Q3Painter that operates on device pdev. Draws an arc defined by the rectangle r, the start angle a and the arc length alen. The angles a and alen are 1/16th of a degree, i.e. a full circle equals 5760 (16*360). Positive values of a and alen mean counter-clockwise while negative values mean the clockwise direction. Zero degrees is at the 3 o'clock position. See also drawPie() and drawChord(). Draws the arc that fits inside the rectangle (x, y, w, h), with the given startAngle and spanAngle. Draws a chord defined by the rectangle r, the start angle a and the arc length alen. The chord is filled with the current brush(). See also drawArc() and drawPie(). Draws a chord that fits inside the rectangle (x, y, w, h) with the given startAngle and spanAngle. Draws the ellipse that fits inside the bounds r using the current pen and brush. Draws an ellipse that fits inside the bounds specified by x, y, width and height using the current pen and brush. Draws a pie defined by the rectangle r, the start angle a and the arc length alen. See also drawArc() and drawChord(). Draws a pie segment that fits inside the bounds (x, y, w, h) with the given startAngle and spanAngle. Draws a rectangle that fits inside the rectangle r using the current pen and brush. Draws the rectangle that fits inside the bounds specified by x, y, w and h using the current pen and brush. Draws a rounded rect that fits into the bounds r using the current pen and brush. The parameters xrnd and yrnd specifies the roundness in x and y direction. Draws a rounded rect that fits into the bounds x, y, w and h using the current pen and brush. The parameters xrnd and yrnd specifies the roundness in x and y direction.